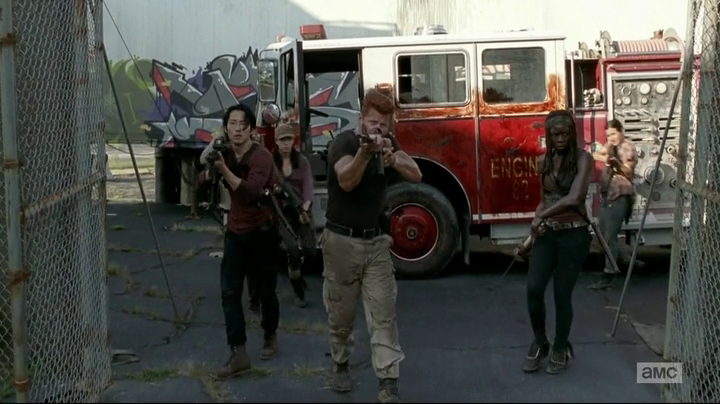 This has been an interesting season for The Walking Dead; it started out extremely strong for a good number of episodes and seemed to have a very clearly defined path and narrative which it was pursuing at full speed. Then somewhere along the line it started to loose faith in itself. Strong story decisions began to be replaced by muddled ideas regarding things like the nature of our hospital antagonists and the fallout after Eugene’s reveal. For all of the bumps in the road this series was still drawing to an interesting and highly anticipated mid-season finale, which ideally would bring together the themes regarding civilization, morality and acceptance and wrap up the ongoing storylines nicely. It didn’t quite do that though. As interesting as it was to see Rick kill a cop in the opening few minutes from a character point of view, it didn’t really tell us anything new about either Rick or the world around him and therefore felt a bit pointless. One of the most compelling things this series set up was a discussion about morality, when and why our characters should kill, and also there was a subtler point being made about law and what was right and wrong in this new world. All of this should have come to a head when Rick (the former cop) and his gang went up against seemingly the only people in this world who are still trying to keep a form of civilization going. This sadly didn’t really develop into anything meaningful despite all of Beth and Dawn’s talks about the hospital and what it costs to keep going. Also, whilst we are talking about underdeveloped plotlines the handling of Tyreese’s avoidance of killing Martin seemingly was put to rest here and that really didn’t go anywhere at all, which frankly is extremely disappointing. 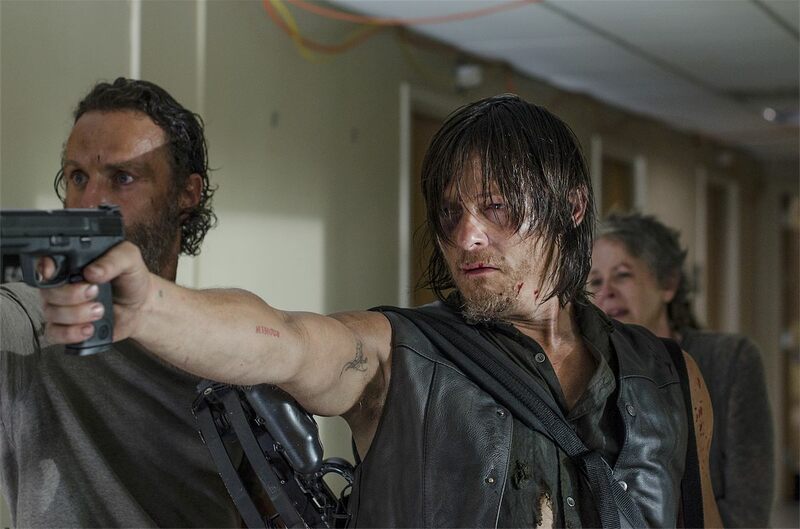 There were things I liked about this episode; Daryl’s reaction to Beth’s death was nicely acted and I look forward to seeing how that shapes his character over the second half of this season. I also enjoyed seeing how our group handled negotiating when they are so accustomed to violence, even though I think more could have been done there. After all there was a lot of strange edits here where we didn’t see a lot of the negotiating discussions that took place, nor did we see Beth and Carol’s reunion. Instead we saw Gabriel’s rather obvious trip which, whilst it was somewhat necessary for his character, really didn’t need to be taking up time in this episode of all episodes. Ultimately this episode leaves me in a rather strange place for the next half of the season. Beth’s decision to stab Dawn was a really forced way of adding drama to the scene, especially so as it makes no sense for Beth to have done that considering it could have easily ended in a bloodbath. What we got here was a tense moment which resolved itself too easily and so the writer’s just inserted character-breaking stupidity to raise the stakes, just like they did with Sasha last week. It’s a shame that we knew so little about the hospital group (we didn’t even know half of the officers in that standoff) as this could have been a devastating display of civilisation falling even further into disrepair. Instead we got a nice character dying as a result of the writer’s lack of imagination who was then grieved by a sister who only just conveniently remembered her. Not perfect ground for going into the next half of the series by any means… but I remain hopeful, if for no other reason than seeing where our gang is going to go next. Both physically and mentally/spiritually. So thank you for reading. Please do comment in the box below, I would love to know your thoughts on this week’s episode and the season so far! You make a couple real good points there on the missed opportunities. I was mad to hear Tyreese say he lied about killing Martin. The lack of showing the actual negotiation too was disappointing. We never got to see Rick and Dawn actually talk it out. I liked the episode, but I can’t really argue your points about the writers unwillingness to explore the collision between our group and this hospital group even further. I din’t hate the episode, in fact i also quite liked it whilst watching it. But once the credits rolled I just couldn’t shake the feeling of being let down by it, and it was then easy to spot some of its many problems!